Krrish (AAC) block is a Lightweight, Load-bearing, High-insulating, Durable building product, which is produced in a wide range of sizes and strengths. Compare to the red bricks AAC blocks are three times lighter. It is a non-combustible, lime based, cementitious building material that is expanding into new worldwide markets. Nowadays Use of AAC block has significantly increase due to low cost and easy structure. Krrish AAC is produced from the common materials lime, sand, cement and water, and a small amount of rising agent. After mixing and molding, it is then autoclaved under heat and pressure to create its unique properties. Krrish AAC Blocks has excellent thermal insulation and acoustic absorption properties. 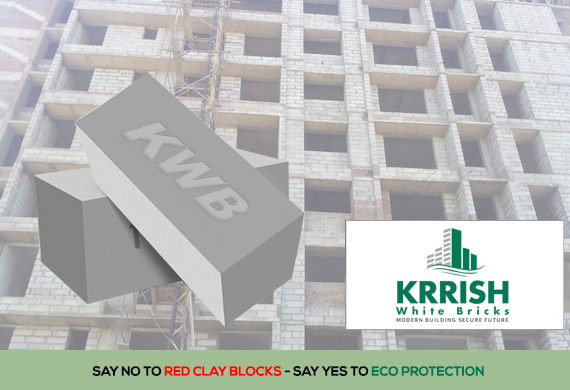 Krrish AAC Blocks are fire and pest resistant, and is economically and environmentally superior to the more traditional structural building materials such as concrete, wood, brick and stone. The resultant building material comprising millions of tiny air pores, is set and cut into blocks and panels of varying sizes, The Blocks are an ecofriendly and sustainable construction building material made using nonpolluting manufacturing process. It makes productive use of recycled industrial waste (fly ash). The Autoclaved Aerated Concrete (AAC) material was developed in 1924 in Sweden. It has become one of the most used building materials in Europe and is rapidly growing in many other countries around the world. AAC blocks are being now used more than 40 % in all construction in U.K. and 60 % in all construction in Germany. In China most of the wall is constructed with only AAC blocks. All developed countries are widely using AAC Blocks in wall construction. The rise in demand in India has been increased more than five times during last three years and as a result today thirty to thirty two plants are producing AAC. In Gujarat as on today eight plants are working. At the point when AAC is blended and cast in structures, a few compound responses occur that give AAC its light weight (20% of the heaviness of cement) and warm properties. Aluminum powder responds with calcium hydroxide and water to frame hydrogen. The hydrogen gas froths and copies the volume of the crude blend making gas rises to 3mm (1/8inch) in distance across. Toward the end of the frothing procedure, the hydrogen escapes into the air and is supplanted via air. AAC Blocks is a unique and excellent type of building material due to its super heat, fire and sound resistance, AAC blocks are lightweight and offers ultimate workability, flexibility and durability. Its main ingredients include sand, water, quicklime, cement and gypsum. The chemical reaction due to the aluminum paste/powder provides AAC its distinct porous structure, lightness, and insulation properties, completely different compared to other lightweight concrete materials. The first Advantage of Autoclaved Aerated Concrete is designed for consumers who are environmentally conscious. It helps reduce at least 30% of environmental waste, decrease over 50% of greenhouse radiation and over 60% integrated energy on the surface of brick, Tiny air pores and thermal mass of blocks provide excellent thermal insulation, thus reducing heating and air conditioning costs of a building. These Blocks is 3-4 times lighter than traditional bricks and is available in custom sizes. As Krrish AAC Blocks is light weight- where dead load of entire construction will reduce by at least 30%. Lightweight blocks reduce mass of a structure, thus decreasing the impact of an earthquake on a building. It reduces overall construction cost by 4-5 per cent as it requires less jointing and reduced need for cement and steel, AAC Blocks gives Variety in size and thickness of blocks helps increase carpet area It reduces overall construction time by 20 per cent this resulting in Labor cost savings as well.